On Valentine’s Day, Ellie Parker and her girlfriend Lucy celebrated with dinner at Asahi Japanese Steakhouse in Lafayette, Indiana. 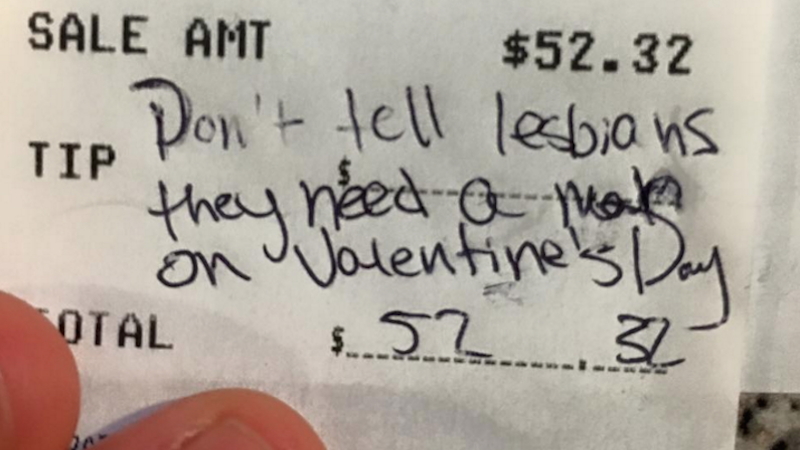 Unfortunately, the festivities were dampened by some garden variety homophobia, courtesy of one of the restaurant’s hibachi chefs. The chef was not content with the women’s answer and remarked in turn, “It’s such a waste to not have a man.” He even “offered to join the pair at home to ‘heat things up.’” Gross, right? “I cannot believe I paid over $50 to have my relationship insulted and sexualized,” writes Parker. Grub Street reports that “Asahi offered Parker a refund — if, that is, she agrees to remove her Facebook post that’s now reached 7,000 shares.” Parker’s remarks still have not been deleted, and, as is evident from this post, they’ve garnered significant attention. Good. And well done, Ellie Parker.